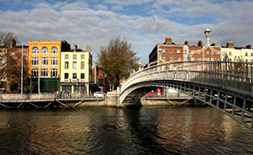 Round-trip international airfare from New York City to Dublin. Private deluxe motor coach and driver/guide the entire time. 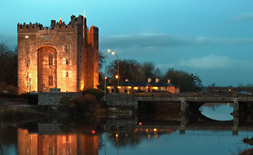 Round-trip transfers (for full package guests) to and from the airport and hotels in Ireland. A visit to the sensational Kylemore Abbey and Walled Gardens. A visit to Malihide Castle in Dublin. A tour of Brigit’s Garden, including a Brigit’s cross workshop. A panoramic sightseeing tour of Dublin. Shopping opportunities in Dublin and on the famous Grafton Street. A full-day pass to Ireland’s largest garden festival “Bloom” in Dublin. A photo stop to see the ruins of Ross Castle. A trip to the National Botanic Gardens in County Wicklow. A tour of Muckross House and Gardens in Killarney. A panoramic sightseeing tour of Galway. 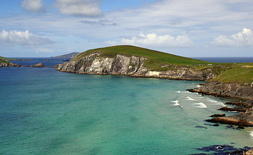 A drive through the scenic Dingle Peninsula. 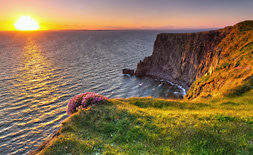 An optional full-day tour through the Burren to see the magnificent Cliffs of Moher and a tour of Bunratty Castle and Folk Park. A visit to the Blarney Woolen Mills and opportunity (for a small fee) to kiss the Blarney Stone. Shopping and sightseeing in the harbor town of Dingle. 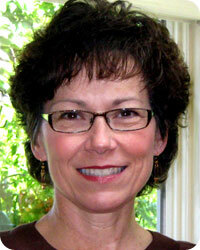 Special presentations with author and horticulture expert Kylee Baumle. Commemorative Craftours totebag, lanyard and luggage tag. All taxes included and insurance is highly recommended. Ross Castle sits on the edge of Killarney's lower lake and was built by O'Donoghue Mór in the 15th century. The Castle came into the hands of the Brownes who became the Earls of Kenmare and owned an extensive portion of the lands that are now part of Killarney National Park . Legend has it that O'Donoghue still exists in a deep slumber under the waters of Lough Leane. On the first morning of May every seven years he rises from the lake on his magnificent white horse and circles the lake. Anyone catching a glimpse of him is said to be assured of good fortune for the rest of their lives. The large rock at the entrance to the bay is known as O'Donoghue's prison. 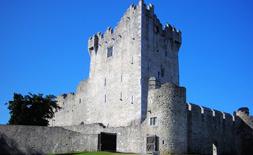 Ross Castle was the last stronghold in Munster to hold out against Cromwell. It was eventually taken by General Ludlow in 1652. 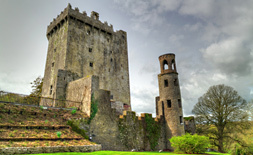 Cost of this optional Cliffs of Moher, Bunratty Castle & Folk Park Tour is only $57 per person.